Open our pantry and you are sure to find a box of Cheerios®. Our whole family enjoys eating the familiar circular cereal with the hole in the middle. Perfect for breakfast, for snack time and trips, we like all the varieties but we usually buy Honey Nut. My parents regularly eat the MultiGrain kind. Just recently we tried out the newest option, Banana Nut Cheerios®. 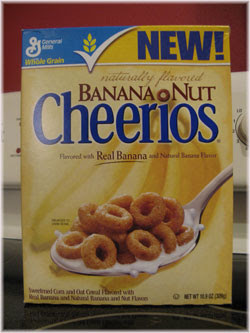 The cereal is flavored with real banana and natural banana and nut flavors, according to the box. Like other Cheerios varieties it is a good source of calcium and Vitamin D, made with whole grain and most importantly, may reduce the risk of heart disease. Now, I'm a big fan of bananas. I even add bananas to my cereal. I also LOVE banana bread, banana muffins, pretty much banana anything. The Banana Nut Cheerios® went over with both kids pretty well. They ate their servings plain, without milk during snack time. Both my husband and I ate ours with milk. The cereal definitely has a sweet banana taste, but the nut flavoring isn't very prominent. That's OK by me though, since I'm not a huge nut lover. If you like sweet, banana flavored products, you'll probably like this new variety of cereal. Try it out for yourself and see what you think! If you visit Cheerios.com, you can access a 55 cent printable coupon. See the banana tree pictured to the right? I've always wanted a banana tree, and now I have one thanks General Mills and MyBlogSpark. Here's your chance to get one, too. General Mills has kindly offered to give three (3) Brimful Curiosities readers an awesome Banana Nut Cheerios® gift basket. The Banana Nut Cheerios® Gift basket includes a coupon for Banana Nut Cheerios, a banana tree with fruit basket, two cereal bowls and a bread loaf pan. To enter, visit http://www.cheerios.com and leave a comment on this post telling me which variety of Cheerios (besides Banana Nut) you haven't tried. • Contest ends on Monday, March 9th, 2008 at 11:59 PM CST. I haven't tried the Berry Burst Cheerios. I love cereal with berries, but I didn't know this kind even existed. Please include me, I am a follower. This new variety sounds wonderful. I love Cheerios in general, but probably love honey nut best. I have never tried the frosted or berry best, or, of course, banana nut. Eager to try it. I also tweeted the contest for an additional entry. I have never tried the berry burst-sounds great though! It made me laugh that this post showed up on Here Be Book Reviews, then I couldn't resist coming over and entering the contest. I haven't tried the yogurt burst Cheerios yet. I haven't tried the yogurt ones yet. The banana nut sounds really yummy! I haven't tried the cheerios crunch. I'm not a big cheerios fan, but they are great for my kids! I'd like to try the Yogurt Burst ones- sounds healthy! I followed you on Twitter and posted about the giveaway! I've never tried the Apple Cinnamon Cheerios. Sounds yummy, though. Ihaven't tried Berry Burst yet! I have not tried Berry Burst but I HIGHLY recommend the Apple Cinammon Cheerios. We discovered them two weeks ago, they're fabulous. I've never tried Yogurt Burst Cheerios! I love eating their Multi Grain Cheerios. Haven't tried yogurt or berry. Sounds interesting! I've never tried, or even heard of the Cheerios Crunch!! I'm subscribed to your feed!! Wow! We've tried them all, except Yogurt Burst Cheerios. Love them all. The fruity cheerios are a good sub for Fruit Loops and other more sugary cereals. I have not tried the Yogurt Burst Cheerios yet...they look really good though :O) Thanks! Ok I had no clue there were sooo many types. My kids love Cheerios. We haven't tried the the Fruity Cheerios. I bet my toddler would love those. The banana sounds great. I tweeted. I am PotamusPrefers. I am a follower, subscribe and grabbed your button. I haven't tried Cherrios Crunch. I didn't even know it existed. Is that bad? I haven't tried furity, yogurt burst, or banana nut cheerios. I don't get out much. I haven't tried the Berry Burst or Cheerios Crunch, but they both look good! I have not tried yogurt burst cheerios. I did not know there were so many kinds! I have not tried the yogurt cheerios. I'm not a big yogurt fan. but was interested to see the fruity cheerios kinda like froot loops only healthy enough to be cheerios. I haven't tried the Yogurt Burst cheerios. Thanks! There are a couple that I haven't tried but this is the first time I have heard about Fruity Cheerios. That sounds like an interesting flavor. Thank you! I have not tried the yogurt Cherrios yet. There are a few of the flavors I have not tried since I always get the plain Cheerios. But I do love the Banana Nut Cheerios! I have not tried the Yogurt Burst. I have not tried the Berry Burst Cheerios yet. I haven't tried the Yogurt Burst Cheerios. These sound delicious! I haven't tried the frosted or yogurt burst cheerios yet. But Cheerios are a favortie in our house! I've never tried Yogurt Burst Cheerios. we have tried the fruity cheerios and the apple cinnamon but we haven't tried the yogurt burst - sounds interesting! We have never tried the Cheerios Crunch, in fact I have never seen it in our grocery stores. Sounds like it would be delicious though!! I haven't tried the Yogurt Burst Strawberry cheerios yet. I haven't tried Cheerios Crunch. It sounds yummy though! And I faved you on Technorati-MommaStaciA. I haven't tried the Berry Burst Cheerios but they look great!